Grandma's Knitting Place: Finally!! I finished it! 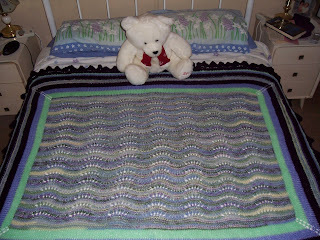 I finally finished this blanket - the edging just seemed to take forever on this one!! I made a lot of other baby things - but I just had to finish this because it was for someone who specially requested it - and is paying me to make it!! 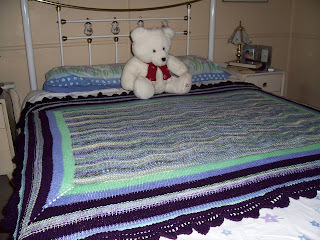 The edging is in a very deep purple - Sandra's favourite colour. I am so pleased to have it finished at last though. This is one of my faults - I do tend to procrastinate when I get tired of something! Fastest little sweater I ever made!